Mumbai, Sep 8: Writer-producer Twinkle Khanna, who once an actress in the Hindi film industry has said that all the films which featured her in the lead should be banned so that no one can watch it. 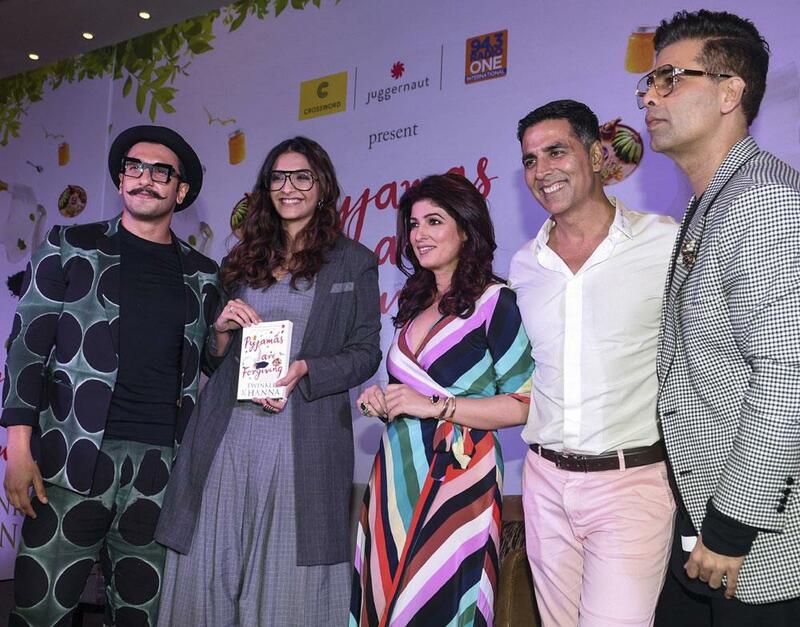 Twinkle interacted with the media at the launch of her book "Pyjamas Are Forgiving", along with husband Akshay Kumar and mother Dimple Kapadia, as also with Karan Johar, Ranveer Singh, Sonam Kapoor Ahuja, Bobby Deol, Tanya Deol, R. Balki, Gauri Shinde, Abhishek Kapoor, Mana Shetty and Sikandar Kher on Friday in Mumbai. Twinkle made her Hindi film debut with "Barsaat" in 1995 and thereafter featured in a series of unsuccessful films like "Itihaas", "Zulmi" and 'Mela'. She quit acting after getting married to Akshay Kumar in 2001. Asked which film of hers should now be remade, she jokingly said: "I haven't given a single hit in fact. I think that all my films should be banned so that no one can watch it." Earlier, Twinkle wrote a book titled "The Legend Of Lakshmi Prasad" which was a collection of short stories - one of which was adapted for Akshay's "Pad Man", produced by Twinkle. Asked whether she thinks that a film can be made on her latest book as well, she said: "I don't think that a film should be made on each story of mine. I have done my job by writing the story and that is all I am interested in." Talking about her latest book, the "Mrs Funnybones" author said: "This is my third book and I guess when I look at everything that I do, it's always about women finding their place in the world. "To me, what I personally find interesting is that, here is a woman who is interested in finding redemption and not finding a man. It also has an interesting premise because it's in stringent Ayurvedic retreat and in a confined environment like the 'Bigg Boss' as when you are in a closed place, all the emotions run high and that was interesting for me." There is a mention of well-known political figure in Twinkle's book. Asked whether it can lead to a controversy, she said: "I don't think that I have written anything which anybody would take offense to. What has been written, it has been in jest. So, I hope people will enjoy the humour and I think they will." Twinkle is a mother to a teenage son Aarav and five-year-old daughter Nitara. Commenting on the constant media scrutiny around her children, she said: "The times are such that I think the freedom that we enjoyed whether it was going by train or taking a cycle and roaming around in a neighbourhood, those times are gone. What does scare me is that once these children become very recognised, it is dangerous for them." As a feminist, what kind of advice she would give to her daughter Nitara? Twinkle said: "There is no advice as such as I think the biggest advice or example that you can give to your daughters is by setting a good example yourself and I hope I am doing that."